ARKTOS Developments Ltd. nominated by Surrey Board of Trade for innovation - Arktos Developments Ltd. In a time when climate change has accelerated the pace of change of the physical world around us, making some parts of the map more treacherous to get to, a Surrey-based company is innovating to ensure no land – or water – is out of reach. Arktos Developments Ltd. manufactures amphibious vehicles for the oil and gas sector. Incorporated in 1993, the company says it has yet to face a competitor offering the same type of product with rivalling capabilities. 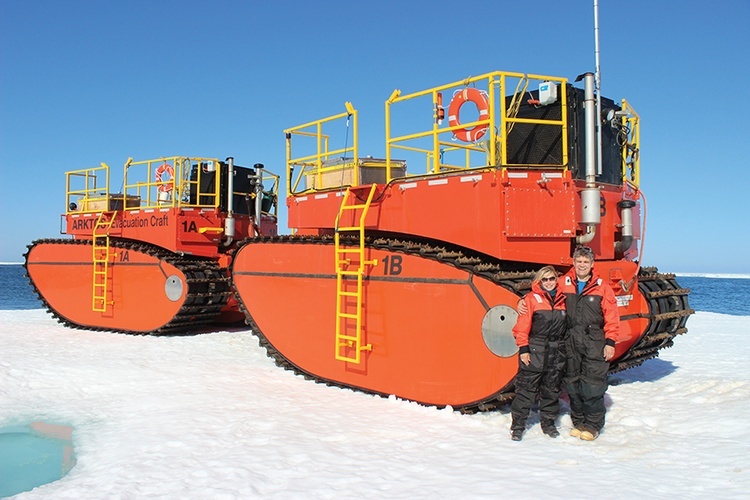 The company’s vehicles can act as boat or land vessels while also climbing in and out of the water over ice and debris. The craft have diesel engines, with water jets to propel them when submerged, and feature unique tracks that, coupled with the machines’ distinct design, make them capable of aggressive climbing manoeuvres. The company is finding a fertile market as storms and other weather events become more extreme, and as more and more large-scale companies and governments invest in disaster–response equipment. Arktos’ success in adapting to the needs of the market has earned a nod from fellow Surrey businesses, with the Surrey Board of Trade nominating the company in the Surrey Innovation Awards. This is the first year the company has entered the competition, and it was its latest design, an air-transportable craft, similar to its current model but with a few tweaked features, that landed it the nomination. “Unless you have our vehicles everywhere in storage, they must be transported by truck or a large ship or airplane but then they can’t land in certain places,” said Arktos vice-president Darlene Seligman. “Currently, we mainly truck them around but that takes a generous amount of time. Standard Arktos vessels weigh between 32 and 50 tonnes, depending on the model. These vessels cost upwards of $3.5 million to manufacture. The air-transportable Arktos weighs less than 20 tonnes and is estimated to cost about $2.5 million. “We are applying for funding at the moment, and hopefully either we get it through support from a larger company or from the government or a combination of both,” Seligman said. The company’s main headquarters and 15,000-square-foot production facility are in Surrey. When in production, the company employs roughly 30 people. In all its years of operating, Arktos has sold mainly to the oil and gas sector, but Seligman sees many opportunities in government, cruise ships and exploration development. The company’s products are at work in China, Alaska and Fort McMurray, with more locations pending. The head office also has one machine on standby for lease should it be needed. As for the future, Arktos still sees its main market in oil and gas companies, but the company knows its amphibious vehicles can be used for more. “For B.C., we have a lot of tidal zones, and we can get in without equipment into oil spill areas and, if we had an earthquake, our vehicles can climb debris,” Seligman said.